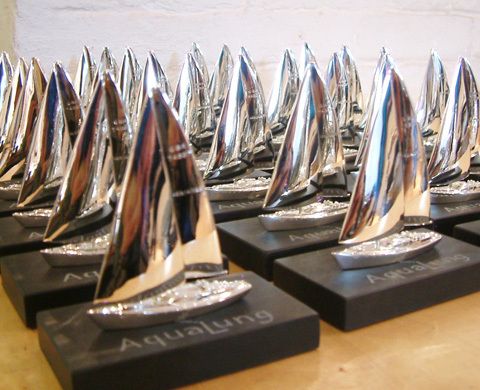 Aqualung Trophy: Silver Yacht Trophy models made for presentation to the generous supporters of the Aqualung Trust, raising funds for the sufferers of Lung Cancer, started by Nick Baker of Camper & Nicholsons. A handmade silver scale model was created of the boat Aqualung. This was cast and assembled, then mounted on a hand cut welsh slate base with hand carved lettering by Helen Mary Skelton.